Today’s image comes from Seattle’s Pike Place Market. Taken a few years ago. One of those rare moments when I made eye contact with a random stranger who happened to wander into my camera’s frame. 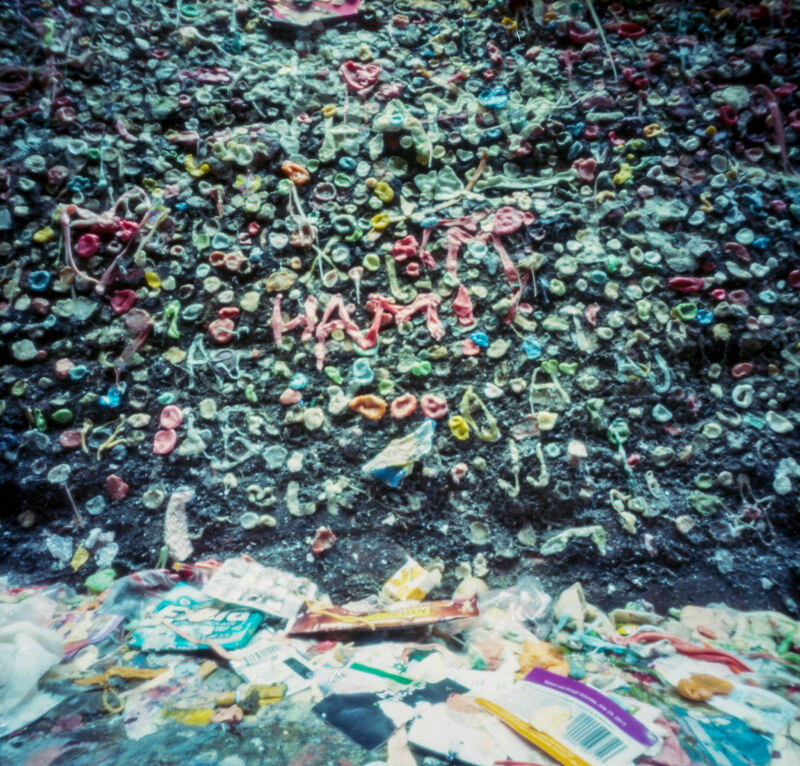 The iconic Gum Wall of Seattle is being cleaned today so I thought, in it’s honor, I would re-post a blog I wrote at Pinhole Obscura a couple of years ago. Enjoy! Exposure time: 1 min 35 sec. Is it art? I think it is. There is something about the collective nature of it that I find completely fascinating. It is repulsive but it is also colorful and pretty in its weird way. And it smells good too! The entire alley smells of sugary sweetness. Exposure time: 1 min. 35 sec. “What if a person just sent an entire camera, with film re-rolled and ready to double expose, to another person? My Pinholga is lightweight and cheap, so if it gets lost in the mail it’s no big deal.” This is an idea I had after pondering film swaps and pinhole photography. And thus an idea started to germinate. A traveling camera film swap. Two film swaps and a dead camera later, I think we are on track. This time with a new name and a new camera. Todd Schlemmer graciously donated one of his Terrapin 3d printed pinhole camera systems to the project! Behold, The Great Transatlantic Pinhole Filmswap 2.0 begins! A few weeks ago I received the new camera in the mail and immediately set out to shoot the roll that Todd had already exposed. I scanned the results last night and couldn’t be happier! I love how they turned out! The camera will be perfect for the project! It has some really cool features, but the best one is that you can rewind the film in camera (no dark bag needed). This little feature makes it perfect for film swaps! Interested in joining the fun? Click here to find out how it works and how to participate. So many layers of ick. Layers. Layers can reveal, conceal, and make something more complex. They can vary in size, texture, color, or functionality. Each layer can have its own story, meaning, or purpose. They can overlap, blend, or be distinctly separate. A layer doesn’t have to be a part of a single object but can even be a slice of a multifaceted image or scene. As I combed through my Flickr archive I realized this photo would be perfect for this challenge. 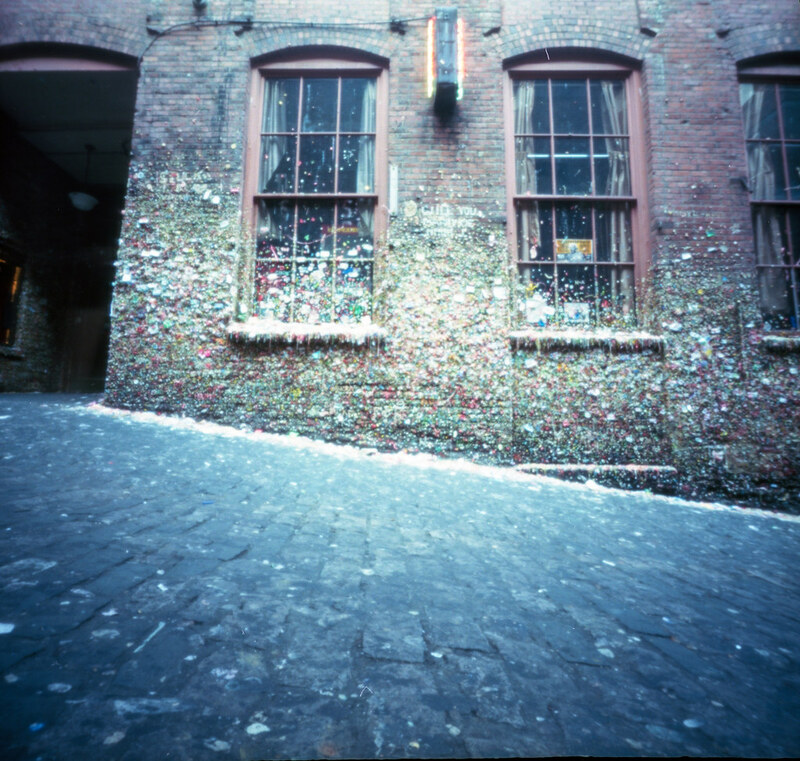 This is the Gum Wall of Seattle, Washington ( I wrote a bit about it on Pinhole Obscura).Sometime in the nineties bored theater patrons waiting in line started sticking their gum to the outside walls in the alley. Eventually it became a thing and the phenomenon that it is today. The gum wall is oddly mesmerizing. It’s disgusting, no doubt. But there is something fascinating about the collaborative effort. This photo was taken with my Canon EOS 650 and Fuji Neopan 400. I am down to one last roll of this wonderful film. I am kind of thinking I might switch to something else for awhile. What is your favorite black and white film?